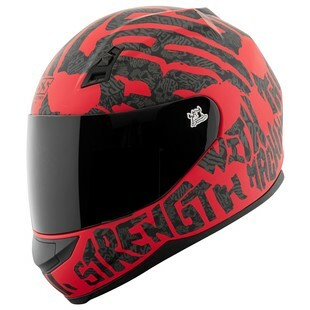 The new Speed and Strength Rage with the Machine Helmet is the newest flavor in the popular SS700 Helmet line. A new look on a fledgling classic, this helmet has attitude. The main difference in this new release is going to be the bold, text-based graphic that Speed and Strength do so well that will really set you apart, and give that aggressive Do-It-Yourself look to any rider. This helmet also comes complete with all the safety and function features that have made the SS700 popular, such as the Lock 'N' Load rapid face shield removal system, the All Clear! anti-scratch and UV-resistant shield, and a DOT rating. This helmet is perfect for the rider on the bobbed Sportster, the rider ripping wheelies on their naked bike, and pretty much anyone that appreciates the edgier underbelly of motorcycling, and wants people to know it.